Jamie Cleghorn is a partner with Bain’s Customer Strategy & Marketing and Technology practices. With Eric Almquist and Lori Sherer, he’s the co-author of the ground-breaking Harvard Business Review article on elements of value in B2B markets. The Value Pyramid, as they term the concept, categorizes the elements of customer value into the levels of a pyramid, with those providing more objective value at the base and those that offer more subjective value higher up. How did you come up with the Value Pyramid? My colleague Eric Almquist came up with it originally. He’s been in consulting for about 40 years, and he’s really been the driver in taking advanced techniques to measure customer behavior out of the academic sphere and into the mainstream. For decades he’s been examining why customers buy. 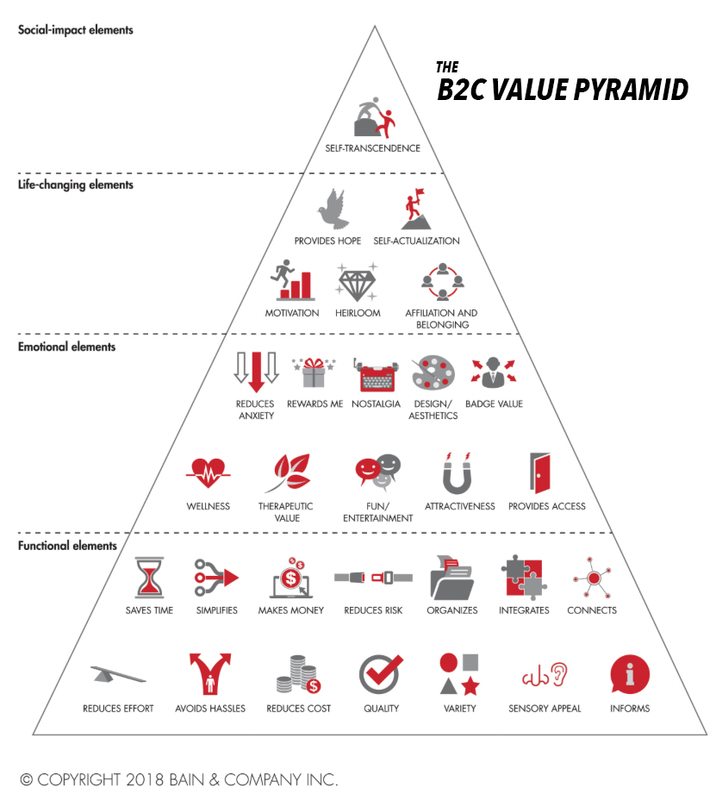 We’ve developed two separate pyramids of value – one for B2C, and the second for B2B. The elements of value at the base are the more common objective criteria we’re all familiar with. It is the higher-level, subjective elements that companies often fail to pay enough attention to. What’s interesting is that the difference between business-to-business (B2B) and consumer (B2C) decisions are not cut-and-dried. Of course B2B sellers need to optimize prices, meet specifications, comply with regulations, and follow ethical practices. Many organizations have B2B procurement teams that evaluate vendors and run total cost-of-ownership models to ensure that rational, quantifiable criteria around price and performance shape their analyses. But those criteria are simply the table stakes. We also find that as B2B offerings become more commoditized, then the subjective, personal concerns of the business customer become increasingly important. Our research shows that with some purchases, considerations such as whether a product can enhance the buyer’s reputation or reduce anxiety play a large role. Businesses that ignore this are going to lose out. So how does an organization decide which elements matter the most? 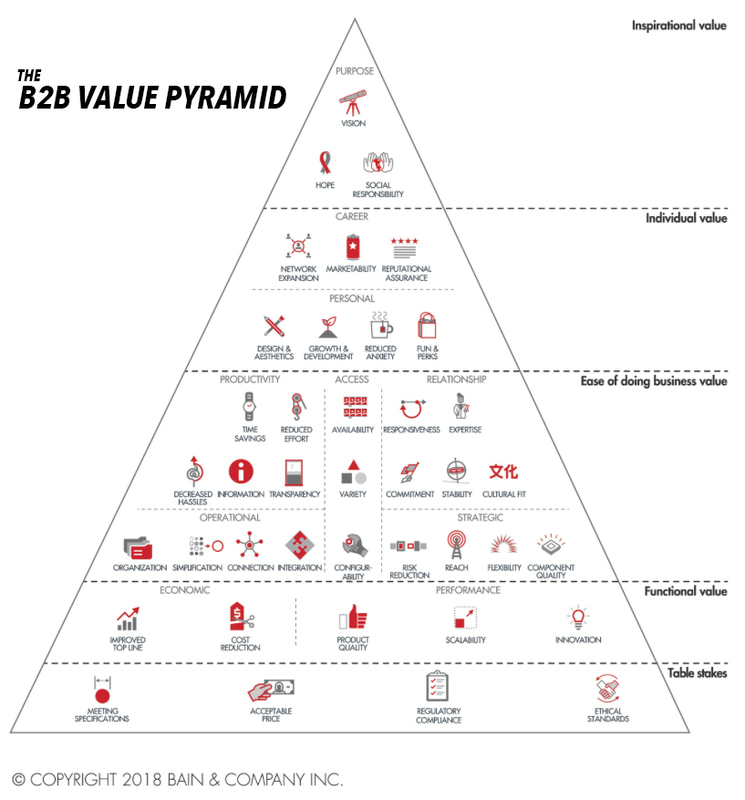 For the B2B Value Pyramid, we find that the base of the pyramid are essentially the table stakes: meeting specifications at an acceptable price in compliance with regulations while abiding by ethical standards. Above that are the functional elements of value, which address companies’ economic or product performance needs, such as cost reduction and scalability. Most B2B companies focus their energy on these functional elements. Above that, it’s about making it easier to do business; some provide purely objective types of value, by, say, increasing a customer’s productivity (time savings, reduced effort) or improving its operational performance (simplification, organization). Now we meet the first set of elements involving subjective elements. They include things that enhance relationships between parties, such as a good cultural fit and a seller’s commitment to the customer organization. The elements at the next level provide additional types of subjective value, addressing individual buyers’ priorities, whether they are personal (reduced anxiety, appealing design and aesthetics) or career related (increased marketability or network expansion.) Here the elements of value address highly emotional concerns. A fear of failure often nags at buyers who spend large amounts of money and make decisions that may affect revenues or many employees. Finally, at the top of the pyramid are the inspirational elements of value: those that improve the customer’s vision of the future, provide hope for the future of the organization or the individual buyers, or enhance a company’s social responsibility. The Value Pyramid framework helps companies address that broader challenge of intangibles. The more emotional elements at the middle and upper levels have traditionally been difficult to isolate and quantify and, therefore, harder to implement. But the battle for differentiation is shifting toward these less transactional aspects. By using modern survey techniques and statistical analysis to quantify all the elements on a consistent basis, leaders can learn what customers truly value and which aspects of an offering merit investment. Executives can bring scientific rigor to their decision making. What steps should organizations take to get started? Benchmark your company’s value proposition against your competitors’ by surveying your customers on how your products and services perform relative to rival offerings on the non-table-stakes elements. Talk with customers to understand their experience. Conduct follow-up interviews to explore their needs and sources of satisfaction and frustration, and the compromises they make in using your products and services. Since many people can be involved in buying decisions, especially at larger organizations, it’s worth mapping who is on the buying team, who has influence on it, and the different priorities and sources of value for each. Apply the acid test. After introducing enhancements, reevaluate how you stack up against competitors, ideally by rerunning the original research. Objective follow-up analysis is important to ensure that your initiatives have actually delivered the value customers are seeking. How does our value proposition compare with competitors? How do we bridge the gaps and seize opportunities to differentiate in the market? Can we launch a minimum viable product without breaking the bank? How does the Value Pyramid relate to the Net Promoter Score (NPS)? Of course it’s highly co-related – they came out of the same practice area at Bain. The Value Pyramid can be viewed as the driver of the elements that create a positive NPS. Let’s look at the the top of the Value Pyramid – what do companies have to do there to stay relevant? Increasingly companies have to look at social-impact and inspirational values because the market, the customers demand it. One of the thing that we see that value is transient. Buy decisions are made by individuals, and as millennials increase their buying power, we see them bringing their values to the table. What was cutting edge yesterday is not what it is today. So there’s a constant race. Since writing these articles, what new insights have you gained? We see that Value Pyramid being used in terms of innovation as well. Companies are interested in building the next offer – and the Value Pyramid is a technology that helps them get there. Or making investment decisions. There are all sorts of financial management decisions that can be made based on the Value Pyramid.